In his sophomore feature as director, Damien Chazelle delivers Whiplash, an extraordinary musical thriller that electrifies and startles in equal measure. 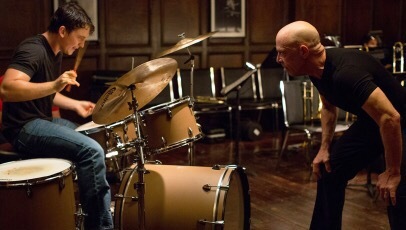 Andrew (Miles Teller), a fledgling drummer, is chosen to be part of his school’s concert band by its conductor Fletcher (JK Simmons), whose ferocious teaching methods pushes and pulls him to breaking point. Ripped from Chazelle’s own experiences, Whiplash unspools with an exceptional and unyielding menace, as Fletcher browbeats Andrew to a terrified shell, forcing him to sweat, distress and spill literal blood. The performances from both Simmons and Teller are superb; Teller remarkable and Simmons defining, chewing up his meaty role as Fletcher with an accordingly ruling dominance. They’re matched every step of the way by skilled execution. Chazelle direction is energetic, with the camera ricocheting from viewpoint to viewpoint, capturing each and every moment in ample detail. The score, too, matches the pitch and dark tone well, building throughout until it – and the characters – erupt in a showdown finale to beat all. A few cockamine narrative twists aside, Whiplash is cinematic perfection; a film that blends musical and thriller tendencies with the age-old theme of following one’s dreams to heartstopping, unflinching and unforgettable avail. Excellent movie – it was so high energy, I probably felt more tense watching that film than any thriller I’ve seen. There wasn’t a single moment when I was watching this movie where I wasn’t in complete suspense. One of my new favorites! This movie left me on the edge of my seat. I absolutely love J.K. Simmons, and he dominated this role. Very articulate review; I thoroughly enjoyed it.